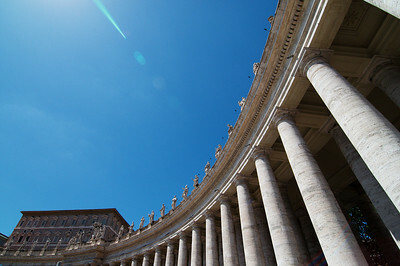 We visited Rome and the Vatican City on a day trip from Perugia. To save time, convinced by Yann's sister, we purchased 10 euro "hop on/hop off" bus tickets to speed around the city. There are tons of competing bus companies, we were approached right off the train by touts from whom we bought tickets. On a hot summer day this service proved to be useful but for the hour spent on the bus in afternoon rush hour traffic. The first stop of the day was the Colosseum which was impressive and very crowded. We waited almost an hour to purchase tickets and be admitted onto the sight. 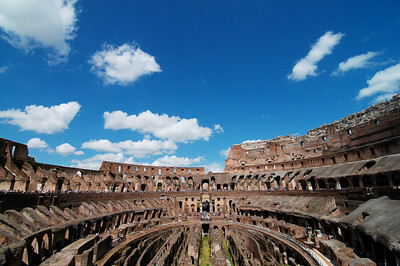 This gave us time to admire the hoards of modern gladiators, most clad in elaborate costumes roaming around looking for unsuspecting tourists to pose with, and charge for their services of course. Sadly, since we've visited, modern gladiating has been banned by the city of Rome. No photos of gladiators in this blog, we're too cheap. 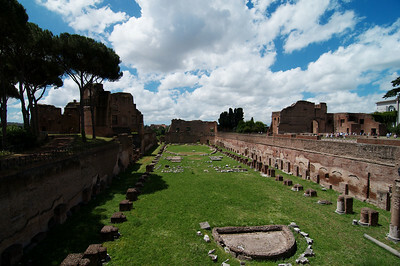 Directly across from the Colosseum is Palatine Hill and the Roman Forum, one of the city's most ancient districts. We wandered around the beautiful grounds for the remainder of the morning, admiring the vast collection of ruins and enjoying a picnic lovingly prepared by Yann's mom. After lunch we took our tourist bus to St. Peter's Square, where were were met with yet another impressive crowd. The line up to enter St. Peter's Basilica was enough to discourage Eve and Mathieu (Yann's sister and her husband) who decided that the hours spent waiting to get into the basilica were better spent elsewhere. 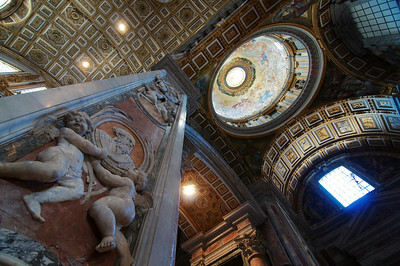 Yann and I opted to endure the wait, but with only a few hours remaining before closing, we had to choose between visiting the basilica dome or the Cistine Chapel (two separate equally long lines). I'm not sure if we realised that they were two lines until well into our wait in the "dome line" so ... we saw the dome (which, along with the views from the basilica roof, were well worth the wait). 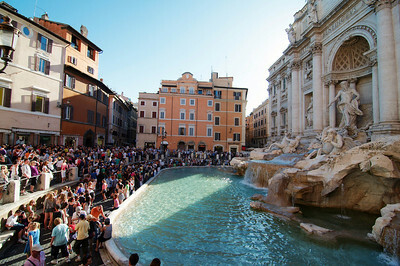 After an eternal 3 km bus ride from St. Peter's Square we were dropped off at the "Trevi Fountain stop" and we headed off in search of the famous sight. We sped walked through narrow streets hoping for some sign of the fountain whose location we couldn't quite make out from our tourist map. 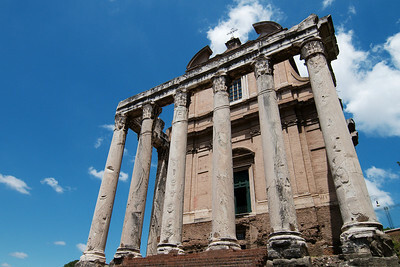 It took a few minutes before we found it, along with every other tourist in Rome. Now running very short on time we didn't mind spending no more than 5 minutes at this impressive, but absurdly busy landmark. 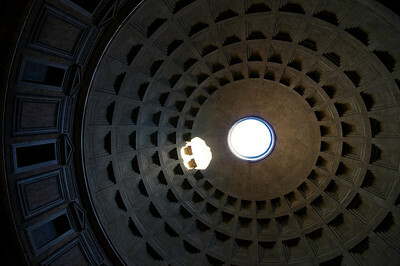 We completed our day at the Pantheon, whose front facade was undergoing renovations. This made for a nice, speedy visit with the highlight being the inner view of the roof. We caught up with Eve and Mathieu at the central station, with just a few minutes to catch our train. We finished our turbo day eating dinner on the train, which was appreciated by all our cabin mates.